Burgers are great, and I love them, but there is something about sliders that is just so goshdarn cute! I've actually made these burgers three times, and I love them the most as sliders. They are very rich and pretty heavy, so I think the smaller portion is the way to go. Incidentally, they would also make great finger food for the Super Bowl. I'm not a huge professional football fan, but I do love eating snack food, so I definitely always look forward to Super Bowl parties! So what makes these burgers so great? You start with a pretty simple burger - meat, a few seasonings, and the kicker: chopped bacon. Thanks to the fat content of the bacon, these won't really dry out, so you don't have to worry about overcooking them. However, if you make these as sliders, you should be sure to chop the bacon pretty small so that it cooks fully. No one likes pieces of half-cooked bacon, right? 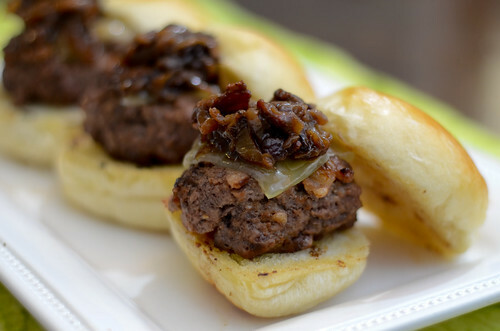 The bacon-balsamic-onion jam is the best part of these burgers though. I don't think I even need to elaborate on that anymore. Bacon. Balsamic. Caramelized onions. The end. FYI it is also an insanely wonderful addition to grilled cheese should you have any left over :) I finished these sliders off with some Gruyere cheese, but I think blue cheese would be really great as well. Or even a super sharp cheddar. If you are looking for more Super Bowl food ideas, check out the Featured Recipes Page. I've updated it with some great options that will all be well-received at any party! Cook the bacon in a large skillet set over medium heat until lightly browned, about 8 minutes. Use a slotted spoon to transfer to paper towels to drain. Discard all but about 2 tablespoons of oil from the skillet. Add the onion to the skillet, season with salt and pepper to taste, add the sugar, cover, and cook for 2 minutes. Uncover and add a splash of water, then scrape up any browned bits from the bottom of the skillet. Cover and continue cooking, stirring occasionally, until the onions are soft, about 10 minutes. Stir in the vinegar, mustard and water. Return the bacon to the skillet and simmer until the liquid has thickened and most of it has been absorbed, 2-4 minutes. Transfer the jam to a small bowl, add another splash of balsamic vinegar, and set aside. The jam can be left at room temperature until ready to serve, or refrigerated for up to 2 days. To make the burgers, mince the bacon. In a large bowl, combine the beef, bacon, Worcestershire sauce, salt, pepper, mustard, and balsamic vinegar. Gently mix into the ground beef, using your hands or a fork. Divide the ground beef mixture evenly into 7-8 portions (depending on the size of your buns), and form each portion into a patty that will fit onto the slider bun. Heat a large (preferably nonstick or cast iron) skillet over medium-high heat and add the patties. Cook 3-4 minutes on each side, or until they reach your desired degree of doneness (I personally like my burgers cooked to medium-well). Top with slices of cheese for the last minute or two of cooking, or place under the broiler to melt. Toast the buns, add the burger, and top with about 1 tablespoon of the jam. Serve immediately. 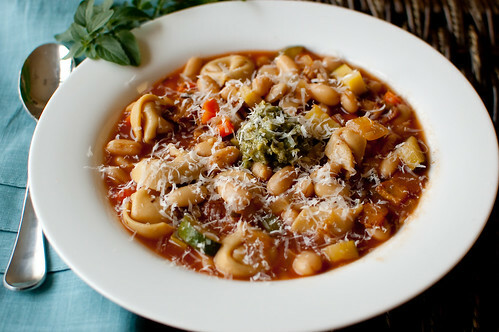 If you are still on the healthy-eating bandwagon for 2012, here is another super delicious recipe for you. Fish is always a good choice when you're trying to keep things light (unless it's beer battered and fried, that is). Seeing as how all things prosciutto are holy, and winter citrus is my obsession right now, this dinner was destined to be a winner. The only beef I have, however, is that my blood oranges were probably the palest ones I've ever seen. I love the deep red, creepy bood oranges, and these were just a little darker than a grapefruit. It's okay though because they still tasted wonderful. Tilapia is known to be a very mild and unassuming fish - one that some may call bland - but I call it a blank canvas. Wrap it in prosciutto and you give it more flavor, plus some crispy texture. Top it with the blood orange salsa and dressing, and you have a home run dinner. I served this with a simple chopped salad, but I think it would also be great with some orzo, rice, or quinoa. Or serve the whole thing over some salad greens and make it into a big entree salad. Preheat the broiler and place an oven-safe cooling rack inside a cookie sheet. Spray it lightly with nonstick cooking spray. Very lightly season the fish with salt, and wrap each filet with 1-2 slices of tilapia. Sprinkle the fish with about 1 teaspoon of orange zest (total, not per filet). Season with pepper and brush with olive oil. 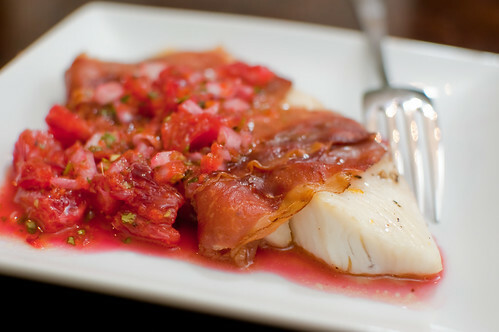 Cook the fish 6-8 minutes, or until the center is completely cooked and the prosciutto is crispy. Meanwhile, zest one of the oranges into a small bowl. Set a strainer over the bowl and peel and segment the oranges. Cut each segment in half or thirds. Squeeze the juice from the leftover membranes into the bowl. Whisk in the lemon juice olive oil, and season with salt and pepper. Add the orange segments, onion, cilantro, and jalapeno and toss to coat. 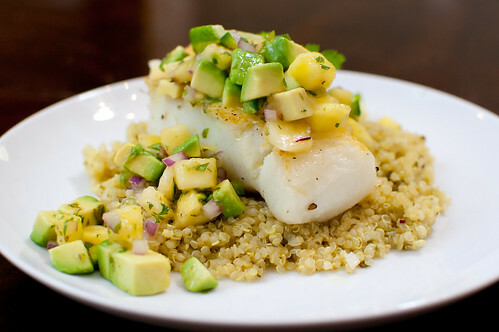 When ready to serve, top each piece of fish with the salsa, and an extra spoonful or two of the orange dressing. There are certain words that just make my skin crawl. 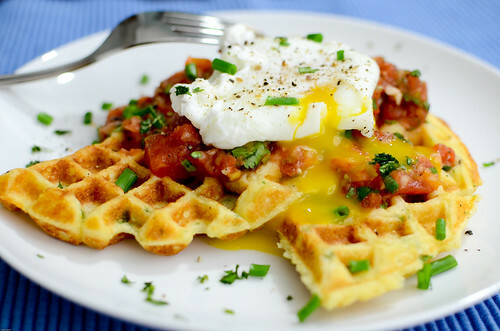 I won't bore you with the (longish) list, but one of the biggest offenders is "brinner." I don't know why I hate it so much, but it just annoys me to no end when people say it. Just say "breakfast for dinner." It's really not that many more syllables. And saying "brinner" doesn't really specify what you're eating: it could be eggs and bacon, waffles or pancakes, omelets, oatmeal, cereatl, etc. It's like saying that you're having dinner for dinner. Or lunch for dinner. I just don't get it. However, I'm certainly not against the concept. 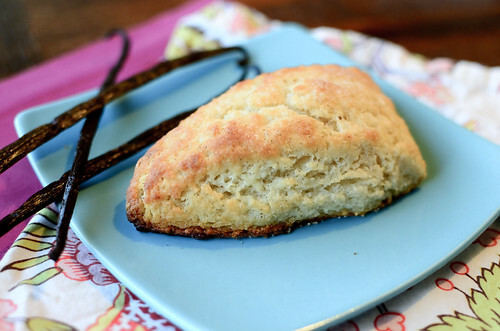 One of my favorite dinners growing up was eggs, grits, and biscuits. And I'm up for pancakes and waffles any time of the day. This is one of those ideas that I was annoyed that I didn't come up with on my own. 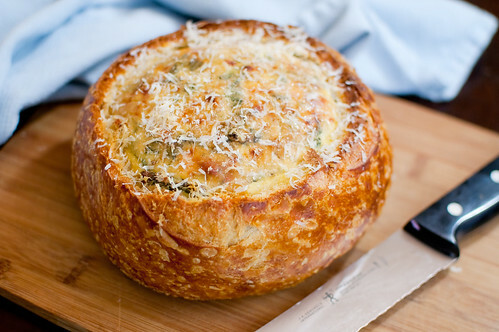 Bake an omelet in a bread boule. Seriously, how ingenious is that?! This particular omelet was really wonderful - lots of kale, Parmesan, ricotta, and just a little bacon. But you could certainly mix up the add-ins with infinite possibilities. Anything you like in an omelet or quiche would be wonderful here. I am pretty partial to this combination though, partly because it is one of the only times Joey has actually enjoyed kale. And not only did he like it, but he ate all the leftovers for breakfast for the rest of the week. Tha'ts definitely a success, considering that he rarely eats breakfast at all. This was such a unique presentation of an omelet. I can't wait to play around with different variations. And I think it would be so adorable to bake individual servings in sourdough dinner rolls (or really any roll that is hard and crusty). The possibilities are endless! barely adapted from Virginia Willis, Basic to Brilliant, Y'all! In a large skillet, cook the bacon until crisp and brown, 5 to 7 minutes. Use a slotted spoon to transfer to a paper towel to dry. Pour off all but 2 teaspoons of the fat. Alternatively, if you want to make a vegetarian version, skip the bacon and heat 2 teaspoons of canola oil over medium heat until shimmering. Add the onion and cook until softened and golden, stirring often, about 4 to 6 minutes. Decrease the heat to medium-low, add half the greens, and toss until they begin to wilt, about 1 minute. Add the remaining greens and season well with salt and pepper. Add the water, decrease the heat to low, and cover. Cook, stirring occasionally, until the greens are wilted and tender, about 15 minutes. Use a slotted spoon to transfer the greens to a large bowl, leaving any excess water in the skillet. Meanwhile, prepare the bread boule. Slice off the very top of the bread and then remove the inside bread in chunks, leaving a shell. Reserve the bread for another use (croutons, bread crumbs, etc). Place the bread boule on the prepared baking sheet. To the greens, add the eggs, 1/4 cup of the grated cheese, the reserved bacon, the red pepper flakes, and the Dijon mustard. Fold in the ricotta and season with salt and pepper. Pour the filling into the bread boule and sprinkle the top with the remaining 1/4 cup cheese. Bake 45 to 50 minutes, or until the eggs are set. Allow to cool at least 10 minutes, and sprinkle with reserved cheese. Slice into wedges using a serrated knife, and serve. Sometimes you just need comfort food. Like when it's cold outside. Or you've had a bad day. Or your toddler has had a fever for five straight days and it peaked at 106 degrees. Or your three month old baby rolls off an ottoman and hits his head. You know, those kinds of days. This lasagne certainly fits the bill. It's homey, it's rustic, and it's utterly delicious. 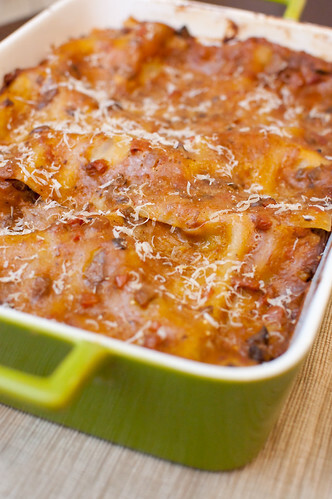 If you love short ribs, you'll love this lasagne. If you love porcini mushrooms, then you'll love this lasagne. 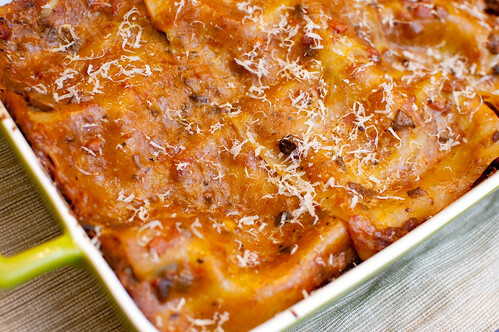 If you love lasagne, then you'll love this lasagne. 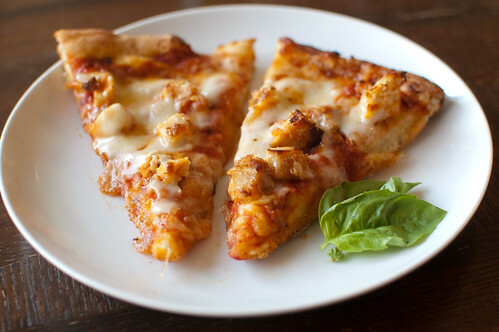 It's rich and filling, but a little goes a long way, so you don't have to eat a giant slice to be satisfied. Though you may eat a giant slice (or two) because it's so darn good. Admittedly, it is a bit of an undertaking from a time standpoint. But it's great for when you want to zone out and forget all your worries and just cook. Nothing is terribly difficult or time-consuming, but from start to finish it will take a few hours - but don't let that scare you away. A majority of the prep-time is cooking the short ribs, so that is inactive. And you can actually make them a few days ahead of time, so that will save you a lot of time the day you plan to serve this. If you are feeling particularly ambitious, you can make your own pasta, but I took the easy way out this time and used no-boil noodles. Which surprisingly taste almost as good as fresh pasta once the whole thing has been assembled and cooked. Once assembled, this lasagne is pretty awesome. The tender pasta, the short ribs (it's hard to go wrong with short ribs), the earthy mushrooms, rich and hearty tomato sauce, and the creamy bechamel all work so wonderfully together. Yes, it takes a long time to make, but what a perfect project for a cold and dreary weekend. While you're at it, invite some friends over to eat. They will most definitely thank you. In a small bowl, soak the porcini in 1 1/2 cups of hot water for about 10 minutes. Drain, and reserve the soaking liquid. Coarsely chop the mushrooms and set aside. Season the short ribs with salt and pepper. In a large Dutch oven, heat 1 Tbs of the oil over medium-high heat until shimmering. Add the short ribs, in batches if necessary, and brown on all sides, 2 to 3 minutes per side. Transfer to a plate and pour off all but 1 tablespoon of fat. Reduce the heat to medium and add the onion, carrot, and celery. Cook until the vegetables are tender, 4 to 5 minutes. Add the garlic and cook until fragrant 30 seconds to 1 minute. Add the tomato paste and cook until it darkens 1 to 2 minutes. Pour in the wine and add the bay leaf. Simmer, stirring and scraping up any browned bits as you go, until almost all the wine has evaporated, 2 to 3 minutes. Add the reserved mushroom liquid and the tomatoes, and bring to a simmer. Return the short ribs to the pot, along with any accumulated juices and the chopped porcini. Cover and reduce the heat to maintain a gentle simmer. Cook, turning the ribs every 30 to 40 minutes, until the meat is fall-off-the-bone tender, 2 1/2 to 3 hours total. Use tongs to remove the ribs from the pot and move them to a plate to cool. Pour the sauce into a heatproof bowl and discard the bay leaf. Allow to sit for a few minutes, until the fat rises to the surface. 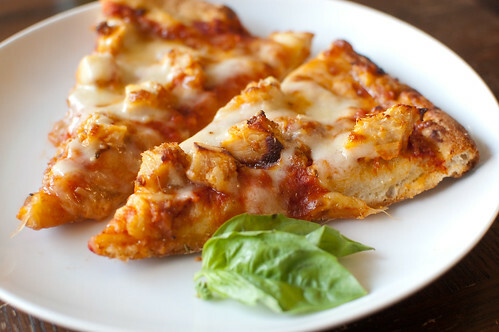 Be sure to get as much fat off as you can, or the tomato sauce will be greasy. Skim it off with a large spoon and discard. When the meat is cool enough to handle, remove and discard the bones and any fat or cartilage. Shred the meat and set aside in a medium bowl. Make the bechamel sauce. Melt the butter in a 3-4 quart saucepan set over medium heat. Stir in the flour with a wooden spoon and cook until golden, stirring constantly, about 2 minutes. Gradually whisk in the milk and add the garlic clove. Cook at a gentle simmer, stirring often, until the mixture thickens, about 10 minutes. Fish out the garlic clove and season with 1 teaspoon of salt. Mix the bechamel sauce into the tomato sauce. Add the lasagne noodles to a large heatproof bowl or casserole dish. Pour enough boiling water over them to cover completely, and allow them to soak about 5 to 10 minutes, or until they are soft and pliable. Drain the water, and when cool enough to handle, line them in a single layer on a lint-free kitchen towel. Pat dry with another kitchen towel. Assemble and bake the lasagne. Heat the oven to 350 degrees and lightly grease a 9x13 inch baking dish. Spread 3/4 cup of the sauce on the bottom of the dish and cover the sauce with a slightly overlapping layer of the noodles. Spread 3/4 cup of sauce over the noodles, and add 1/2 cup of the shredded meat over the sauce. Sprinkle with 1/4 cup of the shredded Parmesan cheese. Add another layer of noodles, then repeat the layers as instructed above, to make a total of 4 layers of sauce and meat and 5 layers of noodles. At this point you should have used all the meat, but still have some sauce and cheese left over. Spread 3/4 cup of the sauce over the top and sprinkle with the remaining cheese. Cover the baking dish with foil and bake for 40 minutes. Remove the foil and bake until the top is browned and bubbly, 15 to 20 minutes. Cool for at least 10 minutes before serving. Sprinkle with additional cheese as desired when you serve. Without a doubt, these chicken enchiladas will forever be my favorite. But it never hurts to try new flavors and combinations, which is why I've also posted enchiladas verdes and vegetable enchiladas. I also have a recipe for shrimp enchiladas that I love but just haven't ever posted. So my point in all this is that I love enchiladas. They will always and forever be one of my favorite Mexican dishes. And anytime I see a new recipe, I'm tempted to try it. 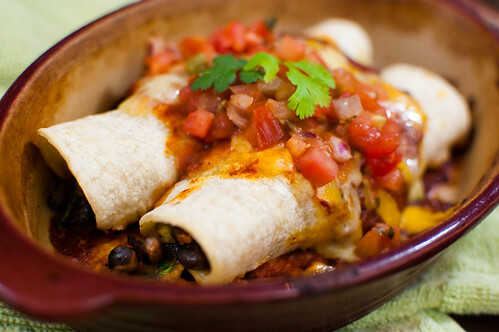 These enchiladas have a lot going for them: they are full of veggies, relatively healthy but still taste indulgent and rich; and the roasted poblano sauce is to die for. It is so flavorful thanks to the combination of chile powder, cumin, and the all-important poblano pepper. That pepper gives the sauce so much spicy/tangy flavor, and I'm pretty tempted to add a roasted poblano to all my enchilada sauces in the future. So so good. It seems like there are a lot of steps and this is a labor-intensive meal, but if you stagger it and work efficiently, it comes together pretty quickly. First, roast the poblano. Then as it cools, start the sauce. As the sauce is simmering, dice and roast your veggies. Then you can just mix it all together, assemble, and bake! To prepare the sauce: Roast the poblano pepper directly over the flame of a gas burner, turning frequently with tongs, until evenly charred. (Alternatively, char under the broiler, turning once or twice, for 5 to 7 minutes total.) Transfer to a deep bowl, cover with plastic wrap, and set aside to steam for 10 minutes, or until cool enough to handle. Meanwhile, heat 2 tsp. olive oil in a medium saucepan over medium heat. Add the onion and saute until softened, 3-5 minutes. Stir in the garlic, salt, cumin, chili powder, paprika and ground chipotle (if using) and cook, stirring constantly, until fragrant, about one minute. Peel the poblano, discard the stem and seeds, and chop. Add to the saucepan along with the tomatoes, water, and chopped cilantro. Return to medium heat and simmer, until the liquid has reduced slightly, 10 to 15 minutes. Remove from heat and puree using an immersion blender, or transfer to a blender or food processor (be very careful if you do this since the sauce will be piping hot!). The sauce can be made a few days in advance and refrigerated. While the sauce simmers, spread the mushrooms, peppers, and onions in a single layer on a rimmed baking sheet. Drizzle with olive oil and sprinkle with salt and pepper. Roast, stirring halfway through, until the vegetables are tender and browned in spots, about 15 minutes. Transfer to a large bowl and stir in beans, 1/3 cup of the enchilada sauce, the cheese, and cilantro. To prepare the enchiladas: Spread 1/2 cup of the sauce in the bottom of a lightly greased 9x13 baking dish. Stack the tortillas on a microwave safe plate and cover with plastic wrap or a damp paper towel. Micrwave 30 seconds to 1 minute, or until they are soft and pliable. Arrange the tortillas in a single layer on a clean work surface. Bake, uncovered, until hot, about 15-20 minutes. Before serving, top with fresh salsa and garnish with cilantro. I have a major weakness for both coffee and all coffee-flavored desserts. Even as a little girl, I loved coffee ice cream. And as much as I try to convince Caroline that my coffee is "yucky," she still likes it and asks for sips when we go to Target (is anyone else incapable of going to Target without also going to the Starbucks in the front of the store?). It was also a cruel cruel punishment that my biggest craving throughout my pregnancy with Smith was iced vanilla lattes. So as much as I love coffee, I'm actually not a huge fan of mochas. I think they are a little too rich for a drink. But mocha flavored desserts? I'm all over those. Sometimes I just can't leave well-enough alone. I started out wanting to make brownies for dessert one night when we were having some friends over. 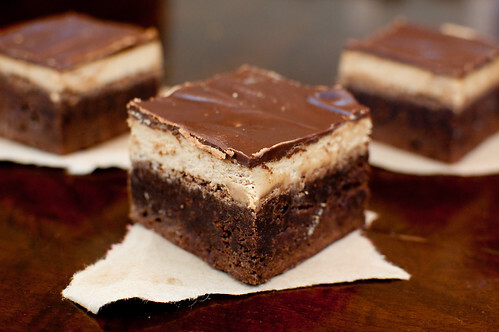 Then when I opened my cookbook to the recipe I use, the espresso brownies caught my eye. So I figured, why not? And then once they came out of the oven, I thought about how awesome they would be if I topped them with some mocha buttercream. Again, why not? And then I remembered these peppermint frosted brownies that I bookmarked at Christmas, and how I loved the thin layer of ganache on top. And I went for it. Let me tell you right now that if you make these, you might as well throw your resolutions out the window. Unless your resolution was to eat more brownies. In that case, good job! I definitely should have cut these into smaller squares... but I didn't. These might be one of the most decadent desserts I've ever made, so it should come as no shock that they are also one of my favorite. And definitely my favorite brownie. Preheat the oven to 350 degrees and adjust the rack to the lower-middle position. Line a 9-inch square baking dish with foil, leaving a 2-inch overhang on two sides. Use another sheet of foil to line the dish perpendicular to the fist piece, leaving another overhang on two sides. Spritz with cooking spray. Add the chopped chocolates and the butter to a medium, microwave-safe bowl, and cook for 30-second intervals, until melted, stirring well after each time. Whisk in the cocoa and espresso powder until smooth. Set aside to cool slightly. In a medium bowl, whisk together the eggs, sugar, vanilla, Kahlua, and salt until well-combined. Whisk in the warm chocolate mixture, then stir in the flour with a wooden spoon. Pour the batter into the prepared baking dish, and spread into the corners with a spatula. Level the surface. Bake 30 to 35 minutes, or until a toothpick comes out with just a few crumbs attached. Cool on a wire rack to room temperature, about 2 hours. In the bowl of a stand mixer fitted with the paddle attachment, cream the butter at medium speed until light and fluffy. Decrease the speed to low and slowly add in the powdered sugar and cocoa powder. As it combines, increase the speed and beat until it has all come together. Add the salt, kahlua, espresso, and heavy cream, and increase the speed to medium. Beat until well combined and light and fluffy. 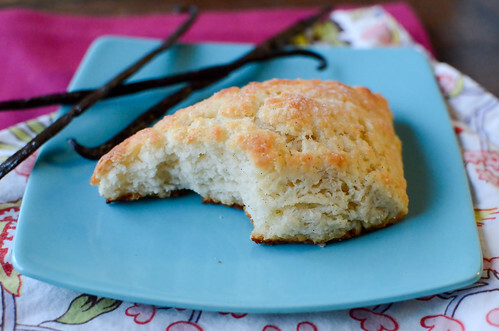 Add more cream or sugar to get the consistency you like. To assemble the brownies, use an offset spatula to spread the mocha frosting in an even layer over the brownies. Allow to set for about 10-20 minutes. then pour the chocolate glaze over the top. Working quickly but gently, use a rubber spatula or the back of a spoon to spread the glaze over the frosting. Refrigerate for at least 30 minutes, or until the glaze is set. Remove the brownies from the pan using the foil overhang, and cut into squares. Everyone and their mother loves spinach-artichoke dip. If it is available at a party, no matter how much you make, or how many people are eating it, it will all be gone by the end of the night. 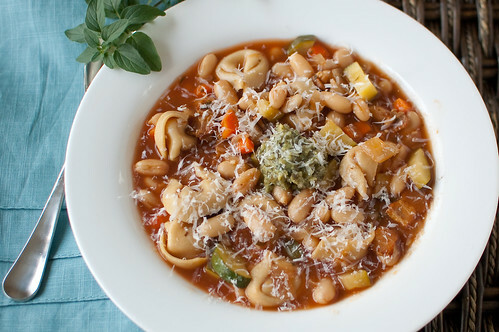 It's a perennial favorite for good reason - it's warm and comforting, cheesy, delicious, and it's "healthy." At least that's what I tell myself. 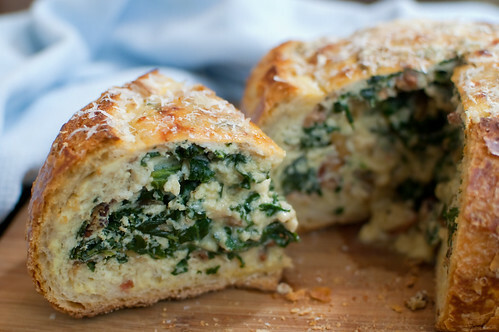 It does have spinach. And artichokes. And vegetables = good for you right? Don't they negate the absurd amount of cheese in there? These mushrooms actually are pretty healthy. They are heavy on the veggies and light on the cheese. And I made them even healthier (and egg-allergy friendly) by substituting Greek yogurt for the mayo, and reduced fat cream cheese for the full-fat version. And of course it should come as no surprise that they are delicious as well. 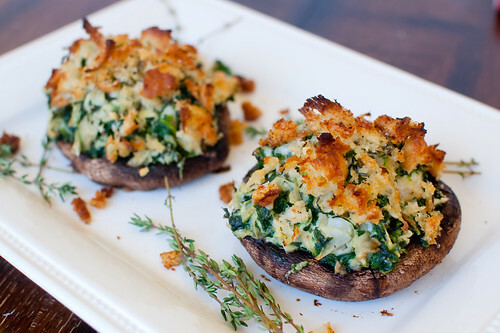 Not only is is hard to go wrong with mushrooms stuffed with spinach-artichoke dip, but they are popping up on several of my favorite food blogs as well. So they are blogger-approved. Served with a side salad, this was a great light and healthy meal, though I think they would also be great as a side to roast chicken, pork tenderloin, or a steak dinner. The filling itself makes a great dip (I had a little left over and had it for a snack the next day!). 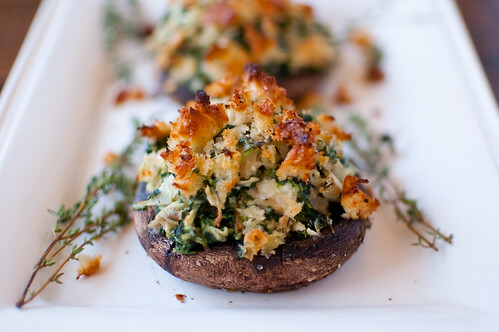 It would also be great stuffed into small mushrooms as well - a lighter way to serve that popular dip at a party! In a small bowl, combine 2 tablespoons of the olive oil and about half of the minced garlic. Brush the insides of the mushroom caps with the mixture and sprinkle generously with salt and pepper. Arrange the mushrooms in a single layer on a baking sheet, oiled-side up. Roast until just tender, about 10 minutes. If the mushrooms gave off excess water, use a paper towel or kitchen towel to blot up the moisture. While the mushrooms roast, mix the cream cheese, Greek yogurt, and 1 teaspoon of the thyme in a medium bowl. Stir in the spinach and artichokes and season with salt and pepper. In another bowl, toss together the remaining garlic, 1 tablespoon oil, 1 teaspoon thyme, breadcrumbs, and Parmesan cheese. Spoon the artichoke mixture evenly into the mushroom caps and sprinkle with the breadcrumbs. Bake until the crumbs are golden-brown and the filling is hot, about 10-12 minutes. Serve immediately. I'm a meal-planner. I sit down every weekend and peruse my cookbooks, spreadsheets, magazines, and favorite blogs for inspiration and recipe ideas, go to Starbucks for a coffee, and then I wander around the grocery store for a while. It's one of my favorite weekend rituals. For the most part I am pretty good about sticking with my menu plan, but there are definitely times when something gets pushed back or taken off if I'm not in the mood for it. I almost pushed off this fish. And if it weren't for the fact that I couldn't bear the thought of wasting the $20 I spent on the wild-caught sea bass, I probably would have. Now to think that this meal could have suffered that fate is pretty crazy. Because it ended up being one of the best meals we've had in a while. You could use pretty much any mild, white fish that you'd like. Halibut would be great, but tilapia would definitely be the most budget-conscious choice (though since it is thinner, you would need to adjust the cooking time accordingly). Pan roasting the fish allows it to be nice and crispy on the outside, while remaining tender and soft inside. The real standout here was the salsa though. It was a perfect balance between sweet and spicy, and the avocado mellowed the whole thing out. 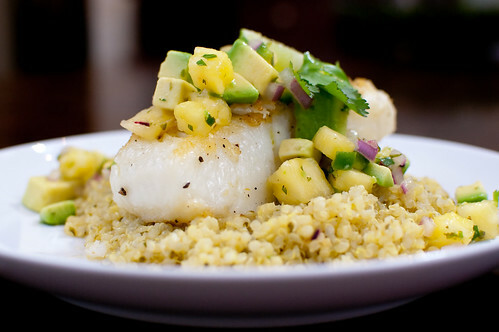 I served this over cilantro-lime quinoa, and we loved every single bite of this dinner. If you aren't a fan of seafood, you could easily serve the salsa over chicken, pork, or even tofu. I also think this would be a great combination for fish tacos. It is below freezing outside right now, but this bright and fresh meal made me feel like summer is just around the corner... I can wish, right? In a medium bowl, combine the pineapple, jalapeno, cilantro, red onion, and lime juice Season with salt and pepper to taste and set aside. Pat the fish dry with paper towels and season liberally with salt and pepper. Heat the oil in a large oven-safe skillet until very hot, but not smoking. Carefully place the fish in a single layer in the pan. Allow to cook, without moving them, for 1-2 minutes, or until they are very light golden-brown. Very carefully flip the fish with a spatula. Remove the pan from heat and transfer it to the oven. Cook 5-7 minutes, or until the fish is opaque throughout and flakes easily with a fork. The cooking time will vary based on the thickness of the fish, so start checking it around 4-5 minutes. To serve, top each piece of fish with salsa.